Tonight, in the Queen's realm of Ilance, two prodigies representing the Knight and Aristocrat factions will do battle in ‘the Adjuvant Trial’. This ritual, which has been held since the founding of the nation, decides which faction will hold military and political authority, and protect the Queen, the living symbol of the realm. The fate of the nation is at stake as these two girls set aside their childhood friendship and undergo a trial in which there can be only one victor. 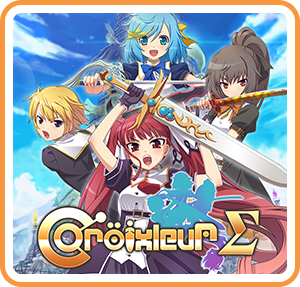 Croixleur Sigma is 60FPS of high speed hack-and-slash arcade action game by Japanese indie developer souvenir circ. and featuring gameplay reminiscent of the Devil May Cry series' Bloody Palace mode. Where can I buy Croixleur Sigma physical/digital?